The bearish seasonality of July to October got put off until the last minute, and now the stock market has tried to do 4 months’ worth of work in just a couple of weeks. One result of that cramming at the last minute is that a pretty deep oversold condition has arisen, which is evident in a variety of indicators, including this week’s chart. As of Oct. 24, only 13 of the 100 stocks in the Nasdaq 100 Index are currently above their own 100-day moving averages. In case you’re wondering, those 13 are AAPL, CA, CDNS, CHTR, COST, ESRX, HSIC, ORLY, ROST, SBUX, TMUS, ULTA, and WBA. Aside from Apple Corp and Computer Associates, there are not a lot of “tech” leader stocks in that group. Even Amazon and Alphabet are excluded. The FANGs have taken the brunt of October’s dramatic selloff. This is a follow-up from my FB post last night. Traders that looked to take advantage of a possible bounce from today’s open have seen moderate gains so far today. So what are the chances FB continues to bounce over the next several days and weeks? I re-looked at the study from last night, and examined how the other 9 instances performed over the next month. The chances for a continued bounce do not appear very good. 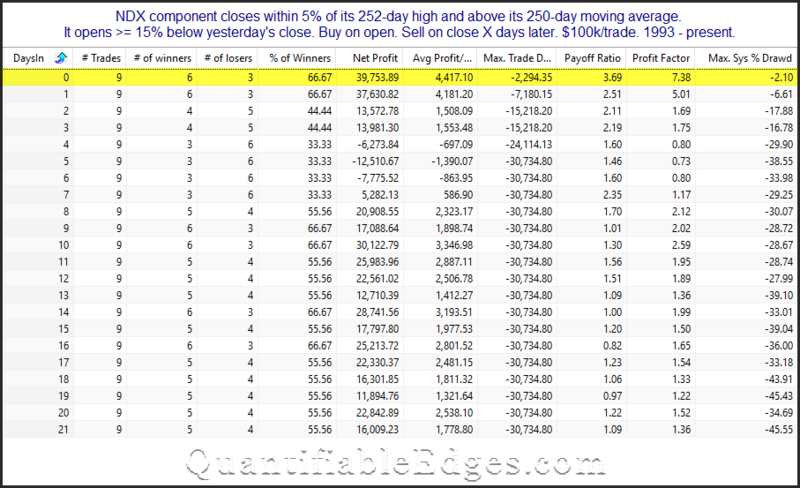 Based on the small sample of 9 instances, gains for the next month actually topped out by the end of the entry date. You can see total gains and most stats above are strongest by simply selling the 1st bar. Of course these results should be taken with a grain of salt, since they were generated on a small sample size, in a different market, and in different stocks. But this one admittedly narrow view is not encouraging. And while it is not enough information to make a trade decision on, I thought traders would find it interesting. As far as Fed Days go, Wednesday was a disappointment. Not only did it fail to rally, but it also left SPX and NDX at 10-day lows. With Fed Days typically bullish, finishing at a 10-day low is quite unusual. The results table below is part of a larger examination I did in last night’s Subscriber Letter (click here for free trial). It looks at prior Fed Day instances of 10-day low closes for NDX when it was in a long-term uptrend. The numbers are quite impressive, and point to a move higher over the next several days. The suggestion is that the Fed Day decline is often an overreaction, and that the market is likely to bounce. NDX looks like it is going to get off to a rough start on Thursday, so it is going to take a momentum shift if we are going to see historical odds play out this time. But seeing some additional selling is not unusual. Every one of the 16 instances saw a pullback of at least 0.6% from the entry price at some point over the next 7 days. I’ll also note that every instance saw a run-up of at least 0.8% over the next 7 days. And the lone loser after 7 days actually experienced a run-up of over 3% before turning down. This study, though limited in its scope, suggests the NDX is setting up for a bounce over the next several days.